Today’s post was authored by a Guest Contributor, historian and sea grass basket scholar Dale Rosengarten. Photo courtesy of Dale Rosengarten. It amazes me when historic objects resurface after decades, even centuries, of lying hidden and unknown. Occasionally, the objects are returned “home”—repatriated, as it were—and amazement turns to triumph and joy. Such were my feelings last September when I gazed at a large bulrush wood basket, in near mint condition, on display at the Coastal Discovery Museum on Hilton Head Island. The museum was hosting a traveling exhibition called “Grass Roots On-the-Road”—a small, low security version of a major exhibit I co-curated for the Museum for African Art in New York. Coastal Discovery’s Vice President of Programs, Natalie Hefter, had put out a call for local residents to lend Lowcountry baskets from their collections to the museum. 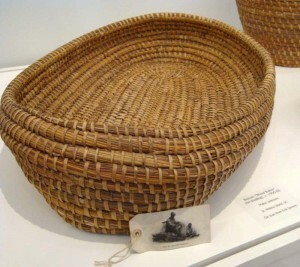 Beaufort resident Erik Stevens turned up with a Penn School basket, circa 1905, probably made by Penn’s first basketry instructor, Alfred Graham, and sporting its original Trademark Tag with Graham’s picture on it. Where has the basket been all these years? How was it rescued from obscurity? Looking for photographs of an old house he was restoring in Beaufort, Erik Googled “Trask,” the name of the family that owned the property next door, and came up with an estate sale of the late Spencer Trask of Saratoga Springs, New York. Among the items listed for auction was a “St. Helena basket.” Erik bid $195—the minimum figure—and bought the orphaned object uncontested. With a bit more digging, Erik learned that Trask was a financier and venture capitalist—a visionary who invested in Thomas Edison’s electric light bulb, headed the world’s first electric power company, and in 1896 became majority shareholder in the New York Times. Trask and his wife, Katrina, who was a poet, had visited St. Helena twice, most likely as guests of Spencer’s business partner George Foster Peabody, who was on Penn’s Board of Trustees. Patrons of the arts, the couple apparently acquired the wood basket to add to their collection. Apart from its intrinsic beauty and strength, what makes this basket so important? Rather than tell the whole story here, I urge you to visit Avery Research Center at the College of Charleston and look at the basket yourself. Erik has loaned it for display at Avery, while we await the opening of the “Grass Roots” exhibition in New York next year. On your way out you can stop in the gift shop, pick up a copy of the book that accompanies the show, and read all about Penn School’s basketry department. Avery, I am proud to say—along with McKissick Museum at the University of South Carolina and the Sweetgrass Cultural Arts Festival Association—helped produce the “Grass Roots” exhibit, as well as a video by the same name with a bonus track that features St. Helena baskets. For more on the basket’s journey, see David Lauderdale, “Lowcountry baskets woven into the fabric of our lives,” Island Packet / Beaufort Gazette, January 1, 2011. What an well researched read!!! Thanks for sharing. Your information is right on! Glad to read your thoughts about it!